What is the difference between a synonym and merging a tag? This question is related to two questions one on this site: What to do with tags that have multiple names in different countries? All merging does is take any previous questions which have one of the synonyms, and convert it to the master, for the sake of consistency. It does not preclude the presence of synonyms. If you merge abseiling into rappelling and create a synonym, people can still find the right tag! If they were to type abseiling into the tag bar, it would suggest rappelling and say abseiling in small text under it. If you support synonyms, there is no reason you should not support merging. Merging is just fixing tags from before a synonym was created. So can someone clarify (as their seems to be some confusion) to me what the differences are between adding a tag synonym and merging two tags together? Is the user above correct? I'm confused because the person (above) seems to be someone who knows what they are talking about but what he suggests seems to contridict the advice I was given in my previous meta post. Merging (a mod-only action) and synonymising are somewhat independent actions, although they can be done in concert (by a moderator). Questions which are tagged foo will act as though they are tagged bar. This is accomplished by adding an entry to the TagSynonyms table in the database. Whenever the tag foo is added to a question (or a question tagged foo is edited), the tag bar will actually be added to the question (in the database). Importantly no changes are made to the posts within the database. Any existing foo questions still have that tag after the synonym is created, although it will seem as though they have the bar tag. In contrast, merging foo into bar is a largely silent process which converts all occurrences of the foo tag into bar. 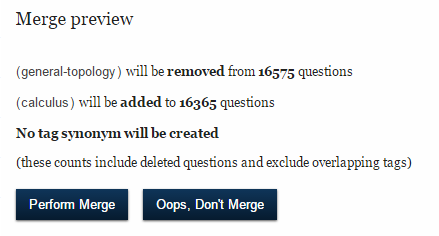 Once the merge is completed, no questions will have the foo tag in the database. But merging alone will not cause the system to see foo and bar as the same. For example, searching [foo] will only return questions tagged foo, and similarly for searching [bar]. When a moderator either creates a tag synonym or merges two tags, they are given the option to complete the other action at the same time. It is possible for either action to be done independently. Merging without synonymising is a useful way to prepare mis-spelled tags such as absieling for removal. Here we don't really want to create the synonym, but the intended tag is obvious. When the tag-removal script later detects no questions with that tag, it will be removed. Merging permanently binds tags together so that all are now tagged with the master tag amongst them. The others remain as synonyms (but appear on no questions). Later decoupling is not possible. When a tag is only made a synonym of another it means that it will appear on no new questions, or remain on any edited questions, but it stays on any untouched old questions. Decoupling it from its master tag at a later stage remains possible. What to do with tags that have multiple names in different countries? 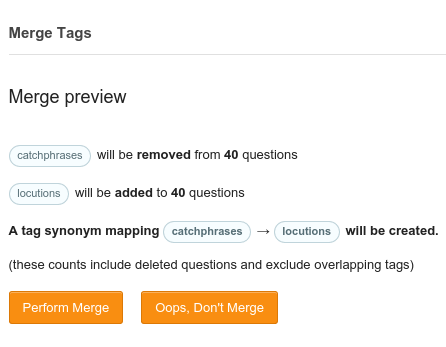 What happens with the tagged questions when a tag-synonym is cancelled?